JNN 19 Jan 2015 Sanaa : Heavy clashes erupted between Yemen’s presidential guard and Shia Houthi fighters around the presidential palace in the capital, Sanaa, media reports said. Gunfire was also heard across the city early on Monday as Houthis closed off all the streets leading to the palace, witnesses told Al Jazeera. The situation has been very tense for the past two days following the Shiite group’s detention of the president’s chief of staff. The Houthis, who demand more rights for the Shiite Muslim sect, seized Sanaa in September and advanced into central and western parts of the country. A deal signed in September between political parties and the Houthis called for the formation of a new unity government followed by the withdrawal of Houthi fighters from the capital. As Yemeni Houthi fighters and army troops waged gun and mortar battles near the presidential palace in Sanaa, the rebels captured the country’s state news agency and TV station. Monday marked the country’s most intensive clashes since September. The clashes were focused on an area near the presidential palace and the residence of the national security chief. The diplomatic compound in southern Sanaa was also affected. It was not immediately clear whether President Abd-Rabbu MansourHadi was in his residence at the time. The street battles in Sanaa lasted for hours, leaving at least two people killed and 14 wounded. The motorcade carrying Prime Minister Khaled Bahah came under fire at a Houthi checkpoint as he was leaving a meeting with President Hadi and his Houthi adviser, Saleh al-Samad, aimed at deflating tensions. A ceasefire was agreed later in the day, although it is not clear if it will hold. 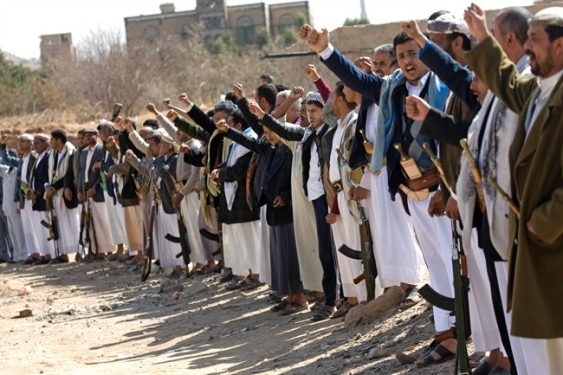 Samad published a list of demands, including what the Houthi called fair representation for Ansarallah, their political wing, and amending sections in the draft constriction violating a September agreement, which made the movement part of the government. “If the previous agreement is not honored, there is a commitment to escalate the situation…and it is difficult to undo the escalation, which will come at a big cost,” he said. The controversial draft constitution was published Saturday. It aims to alleviate numerous tribal, sectarian and regional conflicts in the country, which has faced separatism in the south and an ongoing Al-Qaeda campaign. Houthi Shiites, who are widely viewed as Iran’s allies in struggle for regional power against Saudi Arabia, seized Sanaa and some other parts of the country last autumn. They have since become part of the Yemeni government, but tensions with the Sunni majority have persisted. The escalation of violence came as the Houthis objected to a constitutional reform reducing their influence on government. This entry was posted in Middle East and tagged Information Minister Naser Taha Mustafa, presidential guard, presidential palace, Sana'a, Shia Houthi Fighters, TV Station. Bookmark the permalink.